One of my favorite ways to relax and de-stress is to order a bunch of Chinese food and slowly make my way through it. If it’s a hard day at work, I might grab some friends and go for lunch at the local Chinese hole-in-the-wall. If I was feeling lazy and binge-watching TV, I might get some take out, big bottles of beer and litter the coffee table with takeout containers. Luckily for me, living in Beijing for 7 years had its perks when it came to Chinese food options. I had my pick of a plethora of choices. Chinese tonight? ok, cool…Which one? Dumplings? Noodle? Uyghur? Szechuan? Yunnan? Hot pot? Lamb Bone? Peking Duck? Spicy stir-fry? Each food has a unique flavor profile and was consumed accordingly to my mood and or state of health. Sick? A big bowl of 兰州拉面 (Niuro Lamian or Lanzhou Beef Noodle) would fix that. Celebrating? Let’s go out for some crispy duck! Is it cold outside? Go to spicy hot pot or lamb bone hotpot to stay warm. Feeling adventurous? Go out for spicy, tropical sweet and vinegary Yunnan cuisine. With all these decisions, it could be hard to choose just exactly what to order. So I simplified things just a bit. If something had pork belly in it, that’s what I wanted. If that something with pork belly was spicy, then yes, I definitely wanted that. Now that I’m away from China and my dear take-out spots, I’ve had to learn how to make it myself. Teach a girl to order take out, she eats for a day. Teach a girl how to cook, then there will always be pork belly stir-fry and that is the greatest gift. This is my version of one of my favorite Chinese dishes. Pork belly stir-fried in salty black bean sauce with garlic, ginger and spicy chiles. DROOOOLLLLLLLLL. I gotta go. Need to make stir-fry. For this recipe you’ll need pork belly, chiles, onion, garlic and ginger. You’ll also need Chinese Black Bean sauce (look in the Asian food section of your grocery store for this), soy sauce and rice vinegar. Heat oil in large wok over high heat. Don’t add too much oil as the pork belly fat will render thereby increasing the amount of oil in the stir-fry. Add whole pork belly fat or skin side down into hot oil. Cook on that one side until crisp (about 5 min) then flip pork belly and cook on the opposite side for 1-2 min, lightly searing it. Remove from wok and set aside. When cool, cut pork belly into thin slices. Add black bean sauce mix, toss to combine and continue cooking for 1-2 minutes. Turn off heat and serve with steamed rice. 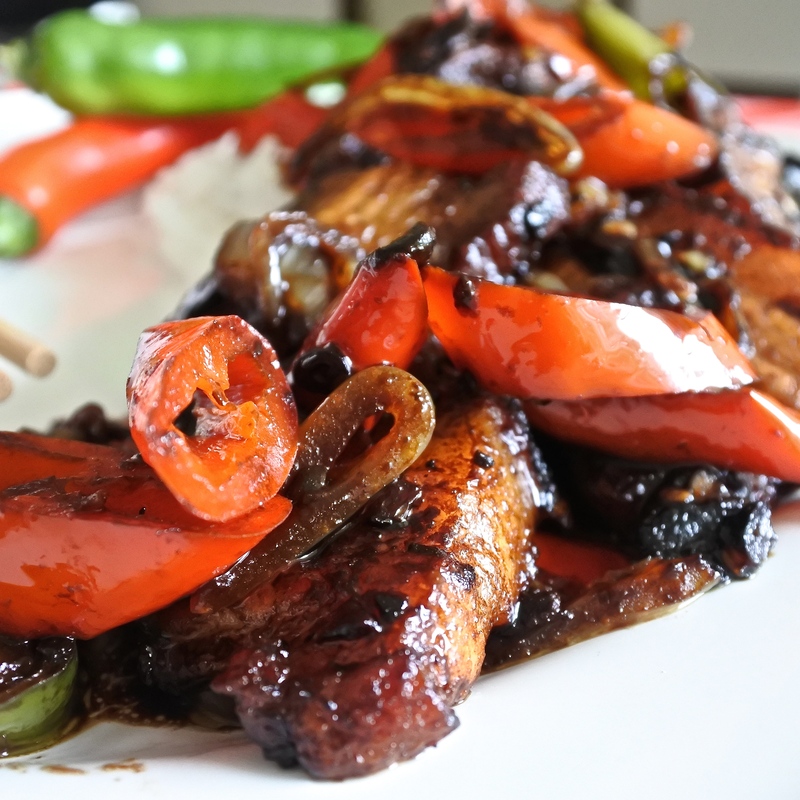 A Chinese stir-fry dish of juicy pork belly, chili peppers and onion cooked together in a salty black bean sauce. You’ll never want to eat anything else. Heat oil in large wok over high heat. Don’t add too much oil as the pork belly fat will render thereby increasing the amount of oil in the stir-fry. Add whole pork belly fat or skin side down into hot oil. Cook on that one side until crisp (about 5 min) then flip pork belly and cook on the opposite side for 1-2 min, lightly searing it. When cool, cut pork belly into thin slices. In a small bowl, mix together black bean sauce, soy sauce and rice vinegar. Set aside. In the remaining wok with the remaining oil, add garlic and ginger slices and cook over medium heat. Let cook until fragrant (2-3 min), making sure that the oil has picked up the flavor of the ginger and garlic but isn’t burnt. Increase heat to highest setting and add sliced pork belly. Continue cooking until meat is thoroughly cooked and is beginning to pick up a crisp brown color. Add black bean sauce mix, toss to combine and continue cooking for 1-2 minutes. Turn off heat and serve with steamed rice.